This is an incredibly world famous hotel, featuring a unique interior, as well as a memorable neon sign. On site you can visit the casino, restaurant and enjoy the views of beautiful landscapes. The decor of the hotel is made in the cowboy style, which is very typical for these places. 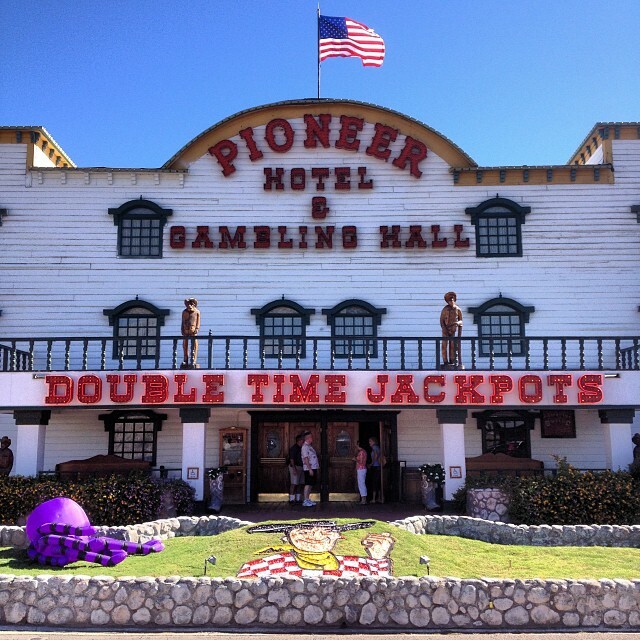 The Pioneer Hotel & Gambling Hall is located in the city of Laughlin. Every year it’s visited by many tourists, so it’s advisable to book rooms in advance. 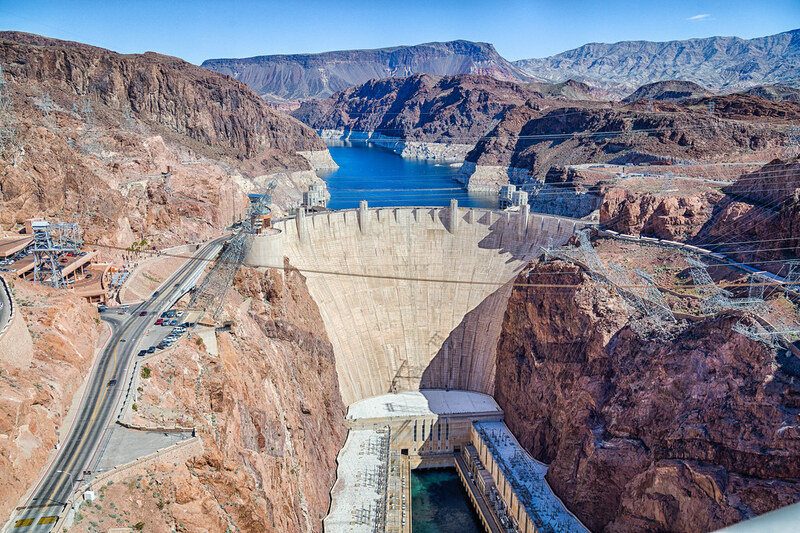 This structure is one of the greatest buildings of the 20th century and the largest dam on Earth. The building process took the efforts of 20 thousand people and years of hard work. Many travelers are attracted to this place with its greatness. The dam blocks the channel of the Colorado River in the Black Canyon and provides water to Southern California. The dam has received the name in honor of the author of the project on its creation – Herbert Hoover. Red Rock Canyon is a very ancient place – 600 million years ago it was covered by the ocean. After that, 250 million years ago, the earth began to rise, and rocks of salt and gypsum appeared above the water. An unusual red hue of the canyon is provided by the oxidation, which is the result of the displacement of rocks from the ocean bottom. The reserve is located about 25 km from Las Vegas and stretches a few more kilometers. In order to take a closer look at the canyon, a road was built between the rocks. Therefore, it’s recommended to rent a car and go on an unforgettable journey through Red Rock Canyon. 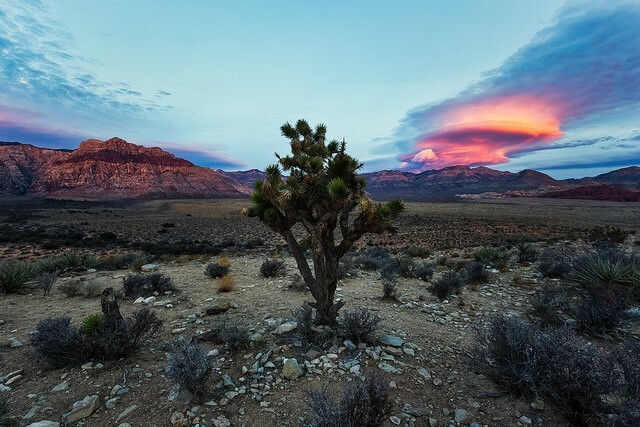 This is one of the oldest parks in Nevada. The reserve is located one hour drive from Las Vegas, and its area reaches 140 square kilometers. 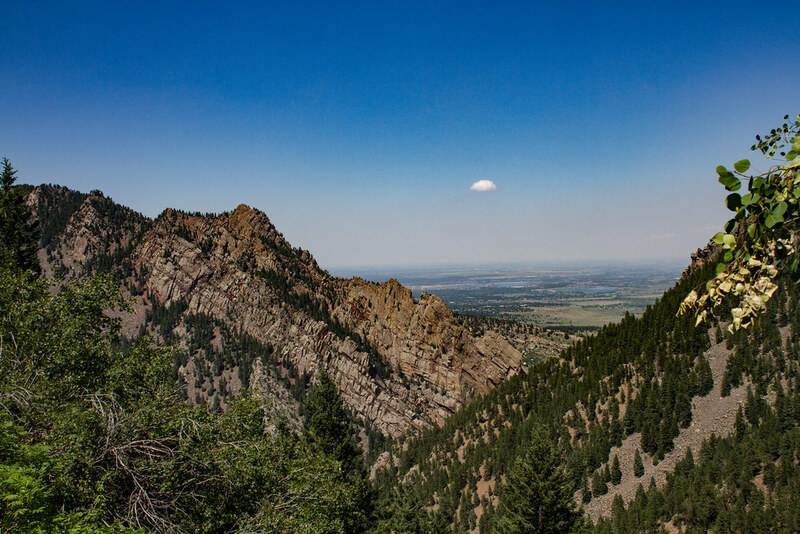 The gorgeous red rocks of this valley were formed tens of millions of years ago. While looking at the park in the bright light of the sun, you will see a beautiful sight. Depending on the shape and location of the rock, the color palette expands from light yellow to red-brown. 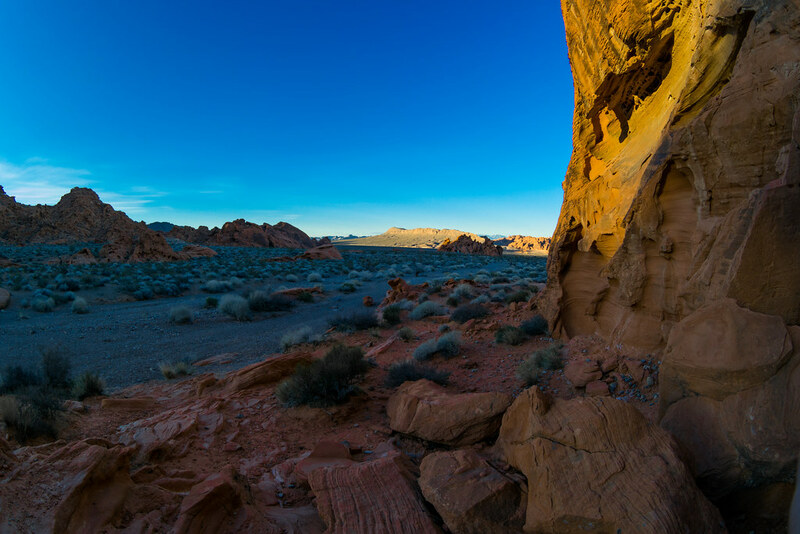 When traveling through the Valley of Fire and admiring the unique breeds, someone may be lucky enough to see the rock paintings of Indian tribes who lived in these places in antiquity. Nobody leaves the valley without a sense of spirituality from touching the history of the Earth. The beauty of the Nevada Black Desert doesn’t end at unearthly landscapes – you’ll find there plains where geysers and geothermal sources are located. A man’s hand was attached to the formation of this geyser. It’s placed on the territory of a private ranch, whose owner once wanted to drill a well and came across hot springs. After some time, the Fly Geyser became the most famous attraction of these places which interests a large number of travelers. 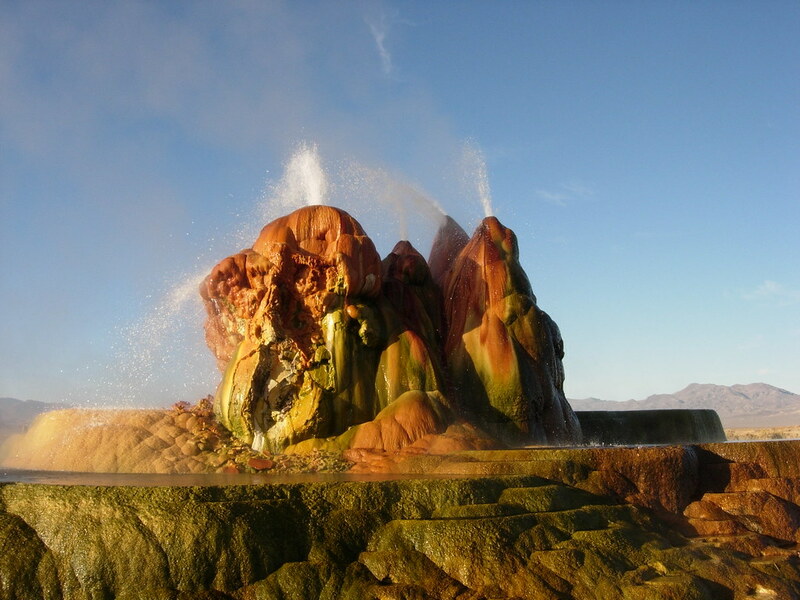 If you decide to visit Fly Geyser, each time it’s necessary to negotiate with the rancher and this fact provide certain troubles to tourists. The source has been growing for over 100 years, and is still increasing in size. Fly Geyser has a beautiful color, which is a result of algae, bacteria and mineral salts dissolving in water. While watching the source, you can even see not a big fish that lives in the multi-colored cascading pools around the geyser. Fly Geyser looks as impressive as Niagara Falls. This legendary place is also located near Las Vegas. In the era of the gold rush in America, the coordinates of the canyon were kept secret, thus it gave rise to many rumors and legends. Everyone thought that only lucky people could find their way to Eldorado. In the modern world is not difficult to visit this mythical place. You will have the opportunity to listen to fascinating stories about gangsters and brave cowboys, visit gold mines, and plunge into the atmosphere of the Wild West. 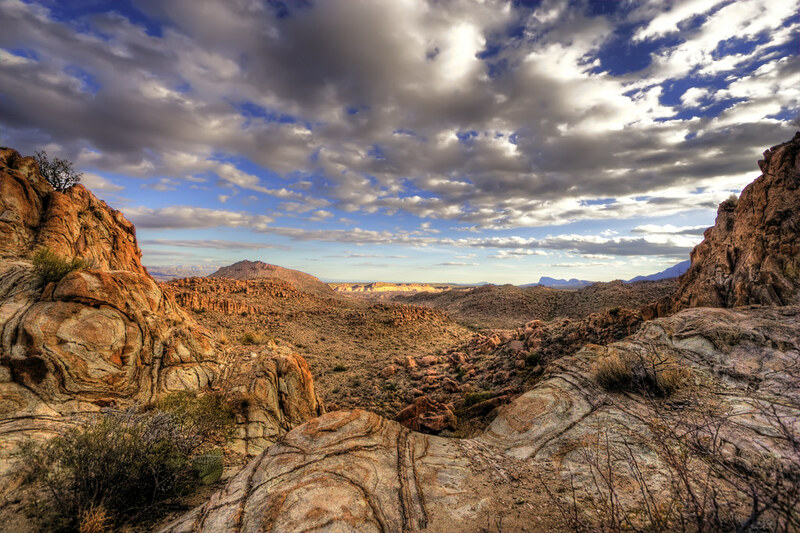 This canyon is located near Laughlin and is part of the national reserve of historic sites in the United States. On the rocks of the canyon you can see a lot of petroglyphs, which were painted by the ancient Indians of the Mojave tribe. Thanks to spring water, there’s a lot of vegetation on the territory of the Grapevine Canyon – this creates a certain contrast with the nearby Mojave Desert. Most travelers like to go hiking in these places in deep autumn or winter. During this period, the air temperature in the Canyon is quite high. That’s why you to stock up on a couple of bottles of water in advance.